Sit back and relax in this perfectly formed garden arbour. Club Price: £220.49 - Save: £24.50 Join Today! 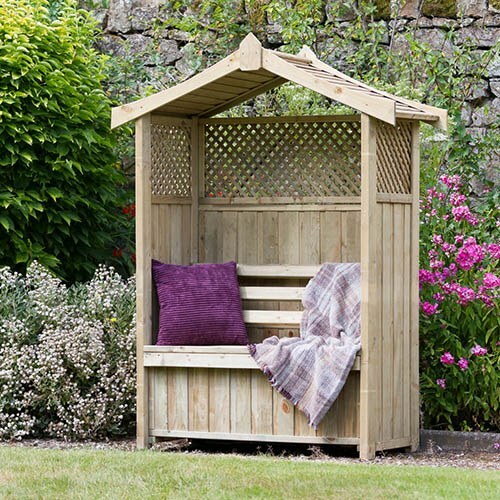 Suitable for all types of weather, the Dorset Arbour is the perfect garden accessory, allowing you to sit back and relax in this private, yet comfortable piece of furniture. Designed with a slatted, curved roof to keep you dry should the weather turn inclement, the stylish wooden seat incorporates an under-seat bench which is ideal for storing your gardening or entertaining essentials. Also featuring stylish diamond trellis, the arbour can be used to create the perfect scented rose arbour by adding your favourite roses. Suitable for any style garden, the Dorset Arbour features pressure treated and FSC® Certified wood and comes with a 10 year guarantee against rot, which means its strong, durable and can be used year after year. Dimensions: 1.57m x 0.67m x 1.995m. Assembly Required - This product is 2 person assembly.